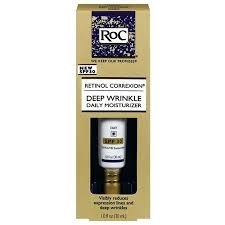 Fight the look of deep wrinkles with RoC RETINOL CORREXION Deep Wrinkle Daily Moisturizer SPF 30. This formula helps visibly reduce expression lines and the appearance of deep wrinkles, while protecting your skin from the sun's harmful rays. Enriched with Vitamin E and SPF 30 UVA/UVB sunscreens, it also helps protect the skin from sun rays, which may contribute to premature aging. Apply generously and evenly before sun exposure and as needed. Children under 6 months of age, ask a doctor. Active Ingredients: Avobenzone (3%), Homosalate (10%), Octocrylene (3%), Oxybenzone (5%). Inactive Ingredients: Allantoin, Aluminum Starch Octenylsuccinate, Ammonium Acryloloyldimethyltaurate/VP Copolymer, Ascorbic Acid, BHT, Butylene Glycol, Butyrospermum Parkii (Shea Butter) Extract, C13-14 Isoparaffin, Ceteth-20, Cetyl Alcohol, Cyclohexasiloxane. Inactive Ingredients: Cyclopentasiloxane, Diethylhexyl 2,6-Naphthalate, Dimethicone, Disodium EDTA, Ethylparaben, Fragrance, Glycerin, Glyceryl Stearate, Glycolic Acid, Hydroxyphenyl Propamidobenzoic Acid, Laureth-7, Methylparaben, P-Anisic Acid, PEG-75 Stearate, Pentaerythrityl Tetraethylhexanoate, Pentylene Glycol, Phenoxyethanol.